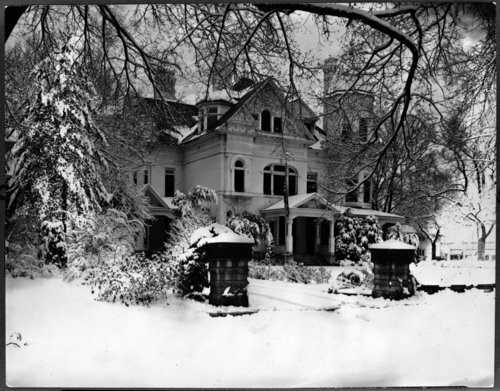 These two black and white photographs show the Bennett home at the corner of Eighth and Buchanan Streets in Topeka, Kansas. Designed by architect Seymour Davis, the home was built between 1886 and 1888 for Erasmus Bennett, a breeder and importer of registered draft horses. The two-story red brick structure trimmed in terra cotta had a hint of a Tudor style with the tall towers and turrets. The Bennett family lived in this beautifully designed and ornate home until 1901, when the state of Kansas purchased the residence for $26,000 for a governor's mansion. As governors came and went, changes in décor were made to the home. The only major structural change to the mansion, was the addition of a sleeping porch built onto the rear. In 1910, Governor W. R. Stubbs had the red bricks painted yellow but later they were painted white and remained so for the life of the house. As the years passed, efforts continued to be made toward the upkeep of the mansion, but it would not be enough to keep ahead of the rapid deterioration. On January 28, 1962, the last official function, a pre-Kansas Day reception, was held at the governor's mansion and by January of 1965 the home was demolished.